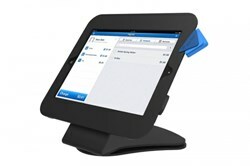 POS Supply Solutions is now offering the Pike iPad POS Stand which turns an iPad into an all-in-one point of sale solution. “Customers that are unsure of what iPad POS stand they need can call our product specialist for a free consultation,” said POS Supply’s President Stephen Enfield. POS Supply Solutions, Inc. has added the Pike iPad POS Stand to their line of iPad POS Stand and Enclosures which allows the user to convert their IPad into an all-in-one Point of Sale Solution. The stand is compatible with nearly all credit card readers and platforms, offers 180° rotation, open access to home and lock buttons as well as front and rear facing cameras, and has custom branding capabilities. Since the release of the iPad in 2010 there has been more than 121 million units sold which has created a large market for point of sale kiosk stands and enclosures. The Pike POS Stand makes it easy for any business small or large to convert their iPad into a Point of Sale terminal. The stand is compatible with today's most popular credit card readers such as Square, PayPal, ID Tech Shuttle, Magtek iDynamo and others. With numerous survey and feedback apps available, the Pike IPad POS Stand can double as a kiosk stand. While the IPad is already safely secured inside the enclosure the stand itself can be secured to a table to prevent theft or tampering. The Pike is very versatile and a great addition to any business looking to utilize their IPad as a POS system or Kiosk Application. POS Supply Solutions provides point of sale and transaction supply solutions, serving a full spectrum of hospitality, retail, financial, taxi, medical, wireless and business transaction applications. Established in 1999, POS Supply Solutions’ corporate facility is located in Danvers, MA with distribution warehouses strategically located across the United States. Over the past 13 years, POS Supply Solutions has worked with thousands of companies to ensure they receive the point of sale supplies needed for successful and efficient business operations. POS Supply Solutions was proudly named to the Inc. 500|5000 list of fastest growing companies of 2011.